Gotta love people who think they don’t need to heed the stop line. 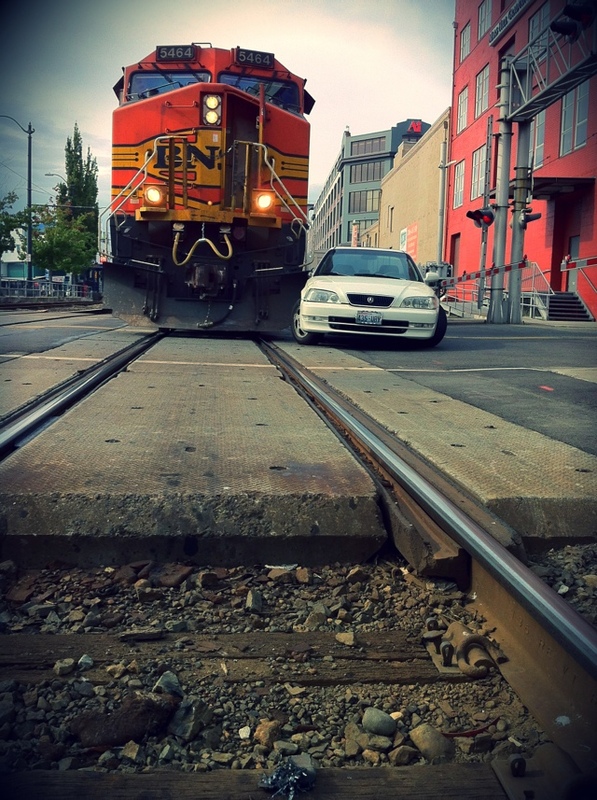 This one took place on the tracks of Wall and Alaskan way this afternoon just before returning to the office from giving blood. Who knows, maybe my O+ will be needed for the next time someone pulls these sorts of antics. No one was injured from what I could tell. Oh and in more awesome news, I’ve given two gallons of blood and now have a pin to prove it. While the standard bathroom faucet can pour out two gallons in a minute, mine took me over a decade. I guess I’m not the guy that will bleed out quickly when we’re taken over by zombies … especially if they make me wait 8 weeks to donate to their cause every time like the vampires in town request. Other fun factoid to end the week, apparently highway patrol units around the country often carry two gallons of Coca-Cola with them to clean up blood off the highway. A myth confirmed by Jamie and Adam in Season one of The Mythbusters. I should go get more fluids in me before I keep rambling.